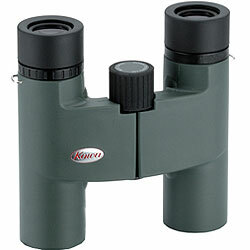 The body of this Kowa BD25 Series binocular is covered in a hard, yet fairly tactile green rubber armour that looks great and will help to protect your optics. They weigh 11.3oz (320g), which is a little heavier than the best in their price range, yet their dimensions, which are probably more important for a compact are fairly standard. Although because of their single hinge design, when folded they are not as compact as those that have a double hinge design. For more take a look at an article I wrote on the Best Compact Pocket Binoculars. Overall I really like the way the Kowa 8x25 BD Binoculars look and feel in your hands and hey have a really solid feel to them that reinforces the feeling of quality. Focusing on an object is achieved using the central focusing wheel which on my sample had a very smooth mechanism. The wheel takes just one turn to go from infinity to it's closest focusing distance of 1.8 meters (6.0 ft). This is a pretty aggressive mechanism which does mean that you can quickly go from one end of the focusing extreme to the other, but it can make a binocular more tricky to fine tuning your focus. However I never had a problem with fine tuning my focus one these which is probably down to just how smooth the mechanism is. The diopter adjustment which plays an important part in correctly focusing your binoculars as it allows you to adjust the lenses separately to allow for differences each of your eyes and is on the right barrel. The ring has marking on it to aid positioning and on mine was tight enough to ensure that it should not easily move out of place accidentally. Although as Kowa state in their literature these 8x25 Kowa binoculars are not designed to be used underwater, they are 100% waterproof and they have also filled with dry Nitrogen gas that not only ensures protection against internal corrosion but it prevents fogging of the glass surfaces on the inside, even with severe and sudden temperature fluctuations. Waterproofing binoculars like these also has the added benefit of protecting the optics from dust or dirt entering the system, an important feature if you plan to use them in dry and dusty locations. With a maximum of 15.8mm (0.62 inch) of eye relief, these are one of the longest eye relief compacts that I have ever reviewed making them ideal for anyone who wears glasses. Twist out eyecups are used that only have two hard stops: flush against the eyepiece or fully extended. Non-eyeglass wearers will just use the eyecups in the fully extended position, whilst eyeglass wearers will not twist them out.You can stop the eyecups mid way, but there is no click stop and so you have to be careful not to push them too hard against the face as they will begin to twist inwards. As I do with all my reviews, to get an objective opinion, I compared the view through these with my benchmark compact binoculars, these have a similar configuration of 10x26. Overall I would say that the quality of the image produced slightly superior to my benchmark. Image clarity, sharpness and contrast were about the same, which means that they are above average and as good as or better than any in their price range. The colour reproduction for a compact was good and I could not notice any colour fringing (chromatic aberration) around the edges of a dark object when viewed in front of a light background, which is excellent. The amount of softening of the image on the edge of the view was also extremely minimal, making them very good in terms of compacts. It was the brightness of the image that was the biggest difference between these Kowa binoculars and the 26mm benchmark. Like all other Kowa's that i have reviewed, these are, for a compact very bright. I suppose the fact that compared to my benchmark these have a smaller 8x magnification which will help with image brightness, but you also have to remember that these have slightly smaller 25mm objectives. So overall I would say that for a compact these rank with the best in terms of brightness. As I have just mentioned, there are many factors that combine to produce the final image brightness, including the size of the objective lens, quality of glass, their coatings and the physical assembly and quality of the prisms. 8x25 binoculars like these Kowa's have an Exit Pupil of 3.1mm and a Twilight Factor of 14.1, which does suggest that poor light performance is not these, or indeed most compact binoculars strongest point. I would however like to add that I often used my compacts, instead of a larger binocular because I am also carrying other equipment like a camera with me and so need a very compact pair. Because I am usually using them for birding or other wildlife observation it is often at dawn or just before sunset when the lighting is pretty poor and whilst it may be preferable to have a larger binocular with better light gathering capabilities, they are still far better than having no binoculars at all. All glass to air surfaces on both the prisms and lenses have been fully multi-coated optics, which you want on your optics and helps with light transmission to produce a bright and sharp image without interfering reflections. As with any binocular in this price range you would expect them to have BAK-4 prisms that are made of superior optical glass to produce clearer images, but Kowa have gone one step further in that they use the Schmidt-Pechan prism design that have both BaK4 and SK15 prisms. This prism design, like normal roof prisms is more compact than a porro prism binocular, which is why roof prism compacts tend to be smaller than porro prism versions. This Schmidt-Pechan prism does have a few drawbacks however. One of which is that the two prisms are separated by an air-gap and one surface of the Pechan prism does not provide total reflection. To get around this Kowa have added their own highly reflective multi-coating that they call C3 coating that they say give a reflectance of 99% or more across the entire visible spectrum. The roof prisms on these Kowa 8x25 BD binoculars have been phase coated which helps to prevent the loss of contrast and resolution. To go into a little more detail, Phase-correction coatings help to reduce the phase shift of light caused by phase differences arising from total light reflection on a roof surface! This all sounds a little complicated, but basically it just keeps the light in correct color phases and has the result of reducing the loss of image resolution to maintain high-contrast images. It is a feature that is only found on high end roof prism binoculars. Their field of view at 1000m is 110m (331 feet/1000 yards), which for a 8x compact binocular is excellent and is as good as most of the very best binoculars like the Leica 8x25 Ultravid Binoculars (110m @ 1000m) and the Steiner 8.5x26 Wildlife Pro Binoculars which has a very marginally wider field of view of 333 at 1000 yards. Close focusing distance is 1.8 meters (6.0 ft), which again is excellent and will work well for something like viewing butterflies and other insects at close distances. The comfortable neck strap is of good quality and well padded and is more than adequate for a light compact binocular like these. The soft leather or leatherette (I can't tell which but it feels like leather) carry case is also well made and well padded. You also get objective lens and eyepiece covers, which are often not included with compact binoculars. This my not seem like much, but is another indication of the attention to detail that Kowa have to ensure that you not only get a great pair of optics, but ones that you can keep in the best possible condition. Their 8x magnification and impressive field of view makes them ideally suited as a compact pair of camping or birdwatching binoculars. This compact size and wide field of view also makes them ideal to take to almost any sporting event where field of view is important to ensure that you catch as much of the action within your view at once. The fact that they are also tough, fog and water proof and have a focusing wheel that is easily accessible and therefore easy to use with thick gloves on will also make them ideal as skiing binoculars. As general use binoculars they are ideal, easy to take where ever you go with a nice close minimum focusing distance for viewing flowers, butterflies or other insects. If however you are looking for a pair of safari or wildlife observation binoculars, where most of what you are viewing is out in open areas, where field of view is less important, I would also recommend considering the the 10x version. Highlights for me include their great looks and very high quality optics that are fully multicoated and have phase correction coatings on the prisms that produce a excellent quality, bright image with a wide field of view. Their minimum close focusing distance is also pretty impressive. Now reduced in price to around $260 - $300 (£280), I would say that in the Kowa 8x25 BD binoculars you have a very high quality compact at a more than reasonable price. Weak points? This is a really great pair of binoculars and as such they don't have any really bad points. I would say though from my point of view, I personally prefer roof prism compacts that have a duel pivot design as apposed to the single pivot one like these. Why? Well it just makes them just that bit more compact when folded, making them easier to store in a pocket when not in use. I will say though that whilst these probably won't fit into a shirt pocket, they will easily fit into most jacket pockets. 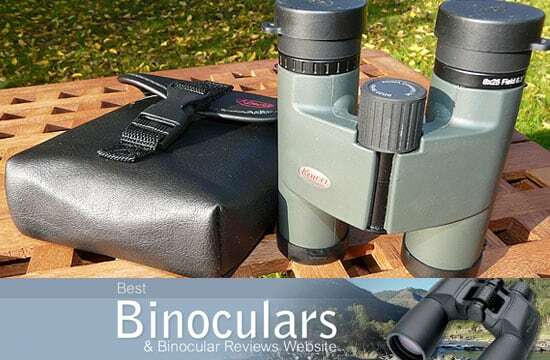 Discount Binoculars: These Kowa Binoculars have been reduced in price on Amazon and Eagle Optics in the USA.